Every chronic disease seems to have a celebrity spokesperson these days and MS is certainly no exception. There are a number of people with connections to the entertainment world who have multiple sclerosis and are also actively trying to bring attention to this disease; quite often a pharmaceutical company is the sponsor of that work. Recently I spoke with David Osmond about his role as a spokesperson for Novartis. We talked a bit about Our Voice in Song, and his song I Can Do This, which is the cornerstone to this campaign, but the majority of the interview was spent talking about his view of MS, advocacy and what we can do for ourselves and each other. His name is familiar because David is a member of one of the younger generations of The Osmonds, the family best known for Donny and Marie and The Osmond Brothers. David grew up with MS as part of his daily life because his father Alan has been affected by primary progressive MS for over 30 years. David says despite knowing some about MS, when he was diagnosed with relapsing remitting MS in 2006, he chose to ignore it and pretend it wasn’t happening to him. Then the symptoms came on that flipped his world upside down and at times even landed him in a wheelchair, unable to walk. It would be almost five years later that David faced up to his diagnosis, and with the support of his wife he decided to take a disease modifying treatment drug, hoping to slow or stop the disease that was keeping him from participating fully in life, especially with his young children. Rather than talk about his MS and his own treatment, though, I wanted to know more about how being a spokesperson for a disease like MS affects him and what he hopes to accomplish in his role. “My biggest responsibility is more than a spokesperson for a drug company, it is more about what I have gone through and continue to go through. I look at my own story and the similarities of the stories of others and it reminds me I am not alone,” said David. “When I was diagnosed it came on so fast and my world flipped upside down. I was in complete denial, anger and frustration, even though I grew up with the term MS. To me this campaign is about education and also motivation that others (with MS) will feel they are not alone in this fight, and not making the same mistakes I made in the beginning. I was in denial and was just coasting. I changed my life and diet and supplementation and I thought I was doing enough. But as I started to have the relapses, I realized I can do more. I had to ask the hard questions and go to my neurologist (and request treatment). This (being a spokesperson) isn’t about one drug – but about asking what can I do now? “I sound like an uber optimistic, over the top happy guy. And I admit I am. But at times I have to force myself and I have to try to be (happy) because I’ve learned it’s better to be happy than sad. Neurologists everywhere say every patient with a positive outlook versus a patient with a negative one does better overall, so why wouldn’t I try that? I have nothing to lose by choosing to be happy. “Having children (two daughters and one son) forces me to put my focus on other things. The needs of my kids, wanting to play all the time, they want to wrestle, and sometimes that reminds me of my MS and what I can’t do but it also gives me motivation to want to try harder. I sing and write music, and it helps to get my emotions out. I read books and I am a fan of movies, especially comedies. I love to laugh because it helps me to forget the pain and disability in my body. “I try to meditate and pray, faith is a big factor in my life and holding onto that foundation I have had since I was a kid helps me to find purpose. “For Our Voice in Song, I wanted to put resources and tools that I use that I find help me, and not just the music video. (Those tips include) Find your own passion – I don’t know what that is. You have to find out what that is – It could be crocheting. But whatever is your passion, use it so you can disconnect from the pain or the disability. Find the things you can do. I know what it is I can’t do (because of my MS), so my abilities mean more than they ever did before and I try to focus on those. To kick off World MS Day 2016, the Multiple Sclerosis Foundation and Novartis partnered to create the #Orangemoji campaign. 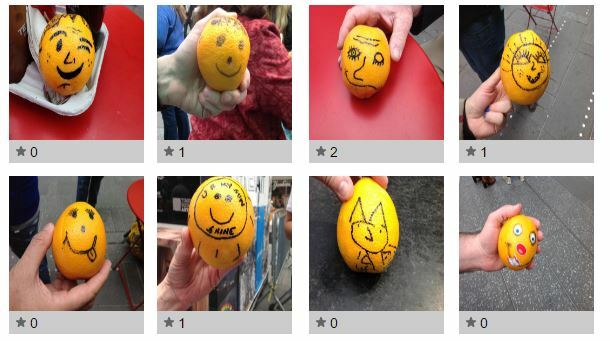 Everyone is encouraged to grab an orange and some markers or other materials and create their own expression of MS. When done, you can upload it to the Our Voice in Song website or use it on your own social media posts to create MS awareness.